^ Evans، T.A.؛ Dawes، T.Z.؛ Ward، P.R.؛ Lo، N. (2011). 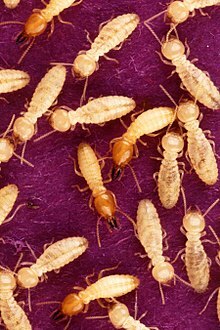 "Ants and termites increase crop yield in a dry climate". Nature Communications. 2: 262. Bibcode:2011NatCo...2E.262E. PMC 3072065 . PMID 21448161. doi:10.1038/ncomms1257. آخر تعديل لهذه الصفحة كان يوم 11 فبراير 2019، الساعة 00:42.